I have had trouble making good casseroles for my kids because of Bubs' milk allergy. I have always done without a cream of whatever soup. Sometimes I just omit the soup from a casserole recipe. Occasionally I would use tomato soup instead (weird, I know, but they like it). The kids haven't seemed to have minded my make-shift casseroles, but I think that's because they don't know any different. 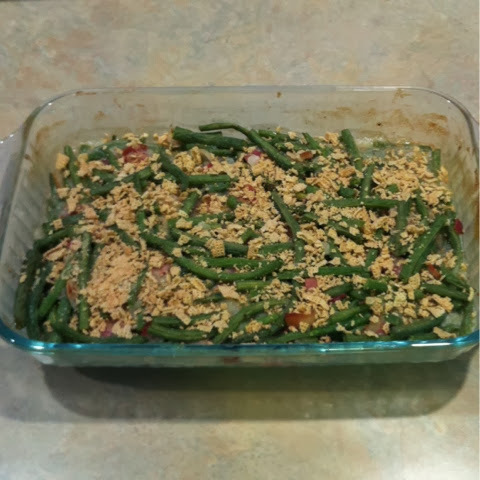 This Thanksgiving, I wanted to try the traditional Green Bean Casserole. I asked around on Twitter for suggestions, and someone suggested using the recipe below for a Cream of Mushroom soup. It was sooooo simple, and it turned out great! Preheat oven to 350º. Cut off ends of green beans and cut in half. Rinse and set aside. Cook bacon (I used the microwave) and cut into small pieces. Mix together green beans, soup, bacon, onions, and black pepper. Bake for 30 minutes. Crush Rice Chex and sprinkle on top. Bake for an additional 5 minutes. *Here is the recipe (click for full instructions) for cream of mushroom soup from Must Follow Recipes with a few minor ingredient changes. 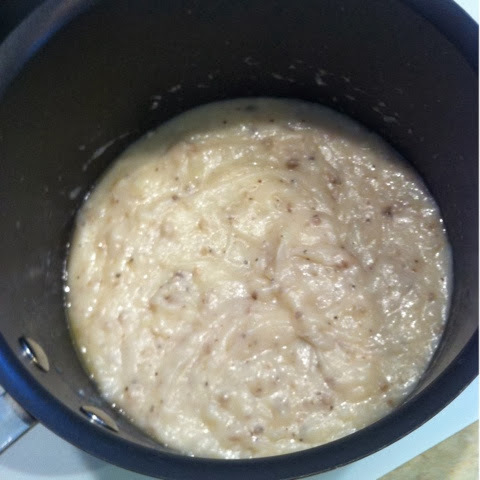 I added the milk cold to the butter, mushroom, onion mixture before adding flour, salt, and pepper. I was distracted and accidentally let it cook too long, so it got pretty thick. I added a bit more rice milk to thin it out. I didn't use the entire amount of soup in this casserole, but I think I could have used more green beans and used the entire amount. This casserole turned out really good. Even though I didn't have those French fried onions to top this casserole, the Chex added a nice crunch. And the soup was just right. I will have to use this recipe again for other casseroles, and even make cream of whatever else I want. I hope you can enjoy this as well!